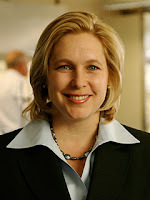 WASHINGTON, DC – Today, local Congresswoman Kirsten Gillibrand again stood up to President Bush and her own party's leaders in voting against the banking bailout. Read the full text of Congresswoman Gillibrand's Statement here. Congresswoman Gillibrand will be one of the guest speakers at Blue Tsunami, next Saturday October 18th.